Very detailed and informative street plan of Lhasa with enlargements for the Old Town and the Marpori Hill, as well as plans and elevation drawings of main palaces and temples. The plan, based on extensive research project carried out under the auspices of the Network of University Cooperation Tibet-Norway, is designed to highlight the city’s architectural and historical heritage and distinguish between pre- and post-1950 developments. The main plan at 1:4,000 covers the central part of the city with the all the main religious structures. 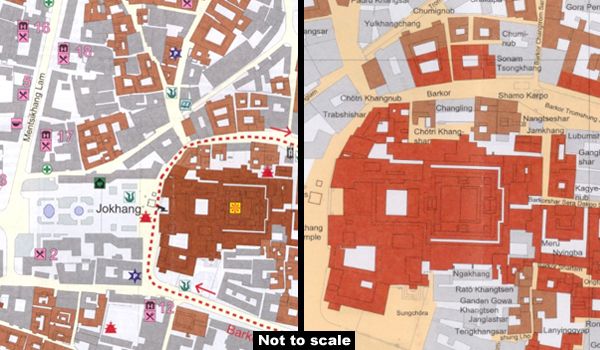 Religious buildings are highlighted and colouring of secular buildings indicates if built before or after 1950. A wide range of symbols shows various facilities: hotels, restaurants, tea houses, banks, etc. ; viewpoints, prostration points, recommended sightseeing route, etc. On the reverse there are plans at 1:3,000 of the Old Town and the Marpori Hill, plus north and south Chakpori, naming individual historical buildings and temples and indicating all development dating after 1950. Detailed plans and elevation drawings are provided for the Potala Palace and Jokhang Temple, plus plans of several other sites. Also included is a plan of the Norbulingka park and a map at 1:60,000 showing Greater Lhasa in 1985. All the text is in English, French and German.